Grab some coffee, tea, or whatever type of energy drink you fancy, this is going to be a long one! We are going to discuss Visual Flow’s Draft Tool, a Step. I like to think of a Step as a sticky note, because it looks like one to me and it is not a permanent part of the Flow. Where is the Step element? You can find the Step element under the DRAFT TOOLS section of the Palette. After you have added the Step to the Canvas, you get to determine the Name and write yourself a description of what this sticky note is for. You can create multiple Steps and have them connected to other elements on your Canvas. After you are done drawing out your blueprint, you are ready to transform your Steps to the next level! The coolest part of a Step is that you can convert it into a Screen element! This is pretty nifty. Simply press the “Convert element” button and a Screen will be created. It is that easy. Also, you can create a Step to be another type of Element. 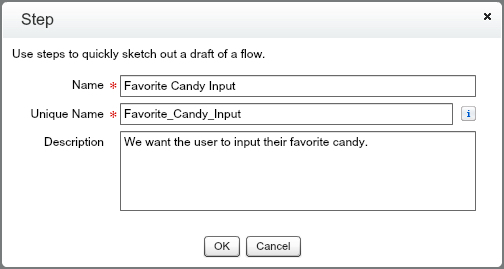 You will not have the ability to “Convert element” into another type of Element, but it can help you save time if you are mapping out the Flow. RECAP: Step elements are your sticky notes in a Flow. You can write a note of what you want to do, and connect another element until you are ready to convert it into a Screen. If you want a quick outline of your Flow before you begin, this is an element you should consider.